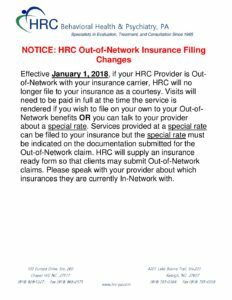 Effective January 1, 2018, if your HRC Provider is Out-of-Network with your insurance carrier, HRC will no longer file to your insurance as a courtesy. If your insurance is Out-of-Network, we will request payment in full at the time of service. Please speak with your provider about which insurances they are currently In-Network with.